Retired IPS officer Zorammawia took oath as the new Information Commissioner of Mizoram. 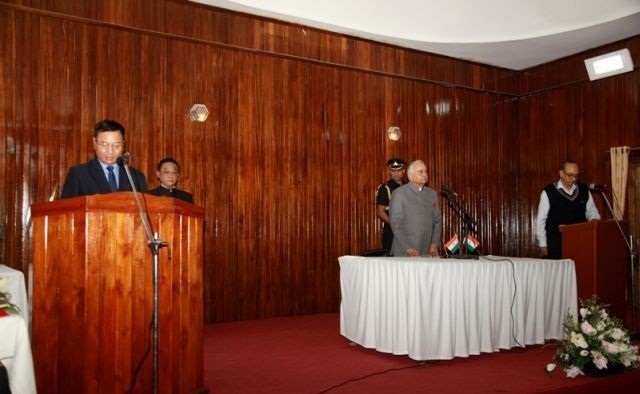 Governor of Mizoram Lt Gen Nirbhay Sharma administered the oath to him at a swearing in ceremony held on Friday at Raj Bhavan, Aizawl. Zorammawia started his career by joining the Mizoram Police Service (MPS) in the year 1982 and later joined the Indian Police Service (IPS) in 1995. He retired as the Inspector General of Police, Mizoram in February of this year. He is a recipient of Police Medal for Meritorious Service in 1998 and also the prestigious President’s Police Medal for Distinguished Service in the year 2005. Zorammawia’s decision to continue service in the government came in the wake of rumour that he might join Mizo National Front and contest from Tuirial constituency.